Samantha Rife is Principal and Founder of SJR Research. For over 25 years, she has worked as a research, writer, and provided administrative support for large and small projects in a wide variety of fields including History, Genealogy, Information Technology, Education, Writing/Editing, Film and Media, Communications, Marketing, Public Health/Social Services, managed Healthcare, Visual Arts, Retail, and the Tourism and Hospitality Industries. Samantha is a mother of 2 children – Joshua and Cassandra. She lives in Gettysburg, Pennsylvania, with her husband Jamie. 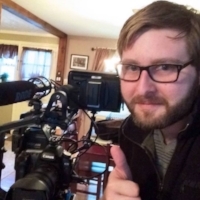 Darren Mitchell is an American actor and cinematographer based in Lancater PA. Darren has written, directed and produced more than 20 short films as well as worked on Hollywood production crews for short and feature films. Darren owns and operates Relevant Noise Media/RLVT Films, a freelance production company for commercial film and television. Jack Chance is a radio producer, filmmaker, photographer, writer, designer, sound recordist & engineer, and "guerilla ethnomusicologist." He has recorded traditional musicians in more than 30 countries and is a contributing writer for the Rough Guide to World Music. He's helped preserve audio recordings for Easter Island's Museo Anthropológico, documented endangered native Alaskan languages and Polynesian navigation techniques in the Solomon Islands, and trains radio journalists and folklorists throughout South and Southeast Asia. Jack is also the producer and director of the award-winning film "The Mountain Music Project: A Musical Odyssey from Appalachia to Himalaya" and oversees MMP's music education and preservation projects in Nepal, Burma, Thailand, and Bhutan. Hunter Lee Hughes is an award-winning filmmaker whose recent work includes writing and directing his debut feature film Guys Reading Poems, released in February, 2018 by Gravitas Ventures. In 2012, Hunter co-created the comedy web television series Dumbass Filmmakers! and wrote and produced the dark comedy short film Winner Takes All, which toured film festivals before being acquired by Guest House Films for their Black Briefs collection. He also co-wrote the documentary film On Common Grounds, which was acquired by the Hallmark Channel. Hunter began his screenwriting career as a story analyst for Paramount Classics/Vantage and spent five years as the writer's assistant to legendary screenwriter Mardik Martin. Two of his plays have been produced with a third - Nathaniel Quinn, Filmmaker - to premiere in August, 2018. He lives in Los Angeles with his 10-year old pug, Romeo. Ashlee Wells Jackson & Laura Weetzie Wilson. Known for their transformative photography for “The 4th Trimester Bodies Project,” these two soulful gals are an inspiring addition to the Reclaim Motherhood team! Matt is a communicator and strategist specialising in movement building, public affairs and creative environmental campaigns. He has worked on flagship campaigns led by Nobel Prize winner Wangari Maathai and HRH Prince Charles, with major corporations and the United Nations and for organisations including: BioRegional, Clownfish and Business in the Community. He founded and edits EcoHustler a popular independent online magazine that receives tens of thousands of hits each month. Michelle is a business development executive and content creator based in Los Angeles with 15+ years of experience representing industries including television/film production, digital ad creative services, creative talent recruitment, traditional business consulting, and healthcare. She is also the host and producer of the variety podcast Nothing Off Limits, which explores topics across society and culture, health, business, and relationships. Her interviews feature authors, entrepreneurs and speakers from all over the world and is distributed on iTunes, Google Play, Stitcher and most streaming stations. Patrick Kennelly is a cross-disciplinary practitioner who works in film/video, theater, and the visual arts. Kennelly’s diverse practice across these disciplines involves writing, producing, directing, designing, editing and curating. He received his BFA in Film/Video at CalArts and an MFA in Theater Direction at UCLA. While principally an editor these days for a wide variety of projects, Kennelly’s recent devised work included the experimental short-form documentary "ten minutes is two hours," shot in South Sudan, and the feature film "Excess Flesh," which world premiered at SXSW in 2015. Erin Maxick has appeared in many plays, independent films and over 25 television commercials. When she isn’t traveling the world performing with her circus theatre company Lucent Dossier Experience, she spends her time creating bars of all natural botanical soap for her soap company Éclore Soap. Additionally, Erin loves animals and works with the Mobile Zoo of Southern California visiting convalescent homes, schools and more with farm animals and reptiles giving pet therapy and bringing smiles. As the President of the Orchid Society of Southern California Erin enjoys leading monthly meetings and orchid workshops, as well as tending to her 200 orchids.